Blue Suede New #46: Ronny Weiser, Rollin' Rock Records, Ray Campi, Dale Hawins, MIghty Blue Kings, Rockin' Rhythmbilly Weekender, Rockabilly, '50s Rock'n'Roll! Issue #40 - Fall 1997 - Scroll down to order!! 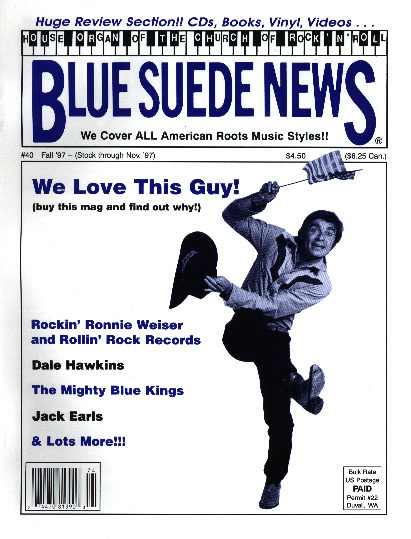 Blue Suede News #40 (Fall 1997) has 68 pages with a slick cover. On the cover is Ronny Weiser, producer of tons of great Rockabilly records in the '70s and early '80s, now active again with his own Rollin' Rock Label. He re-discovered old Rockabillies like Ray Campi, Johnny Carroll, Jackie Lee Cochran, Mac Curtis and others and recorded them in his low budget home studio with amazing results. Those records became sought after in Europe, the USA was not quite ready for his high energy Rockabilly. This interview starts with his upbringing in Italy, his love of American music and lifestyle and of course his musical discoveries. One of the other main features in this magazine is a story about Dale Hawkins titled "Oh Suzie Q" and beyond. All the information you could want about this young white kid from Louisiana who hit the charts in 1957 with a rock'n'roll song but wanted to be a Blues singer. There is a very interesting interview with Jack Earls, one of the wildest SUN Rockabilly singers, he recorded great raw stuff for the Memphis label. The Mighty Blue Kings, an excellent Jump Blues and Swing outfit from Chicago are featured with an article. There is also a story about a movie called Zachariah, featuring Country Joe & The Fish, Elvin Jones, the James Gang, Doug Kershaw and others. There is a great photo page from the Denver Rock'n'Rhythm-Billy Weekender #2 featuring The Planet Rockers, Kim Lenz, Mack Stevens, Ray Condo and The Raging Teens. Also included a story about the Magnetics, they recorded for Rollin' Rock, too. Last but not least live reviews of shows by Sleepy LaBeef, Ray Campi, Josie Kreuzer, Wayne Hancock and BR5-49.